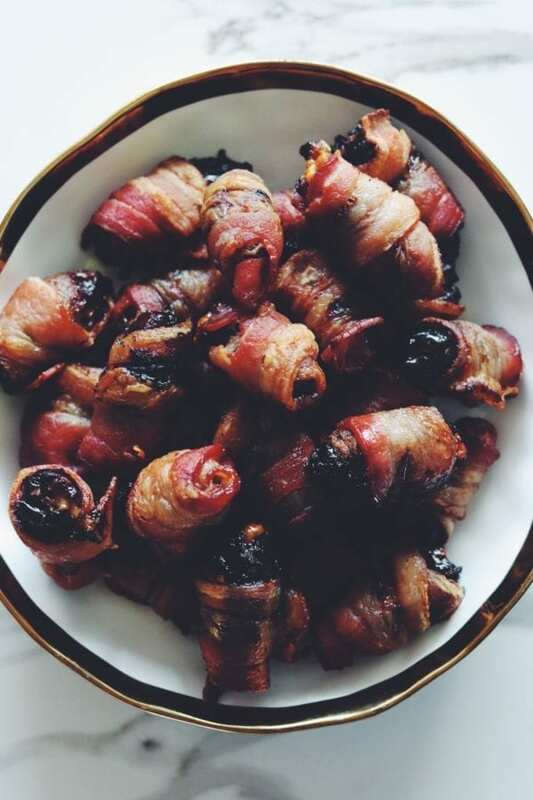 Bacon wrapped dates stuffed with blue cheese is legitimately one of my favorite appetizers. 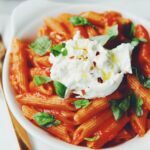 It’s sweet, savory, cheesy and meaty! And when you use them to make a bouquet, they’re even more perfect! 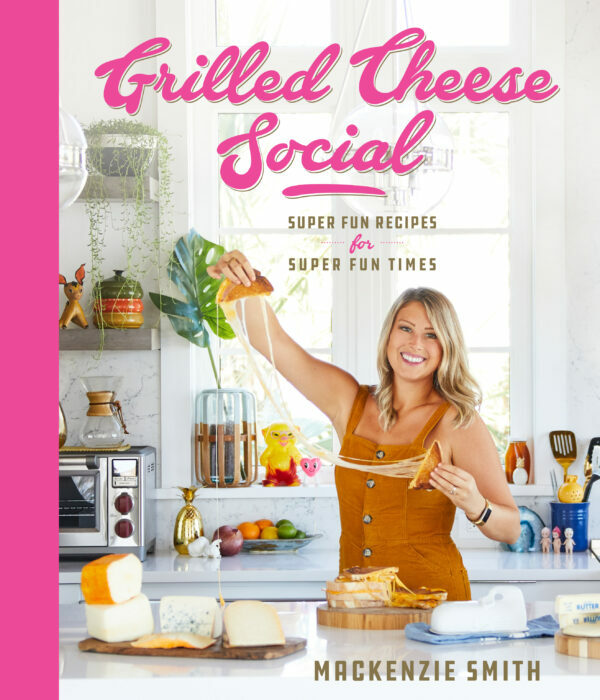 And best of all, they make the cutest Valentine’s and Galentine’s gift for the cheese and charcuterie lover in your life! 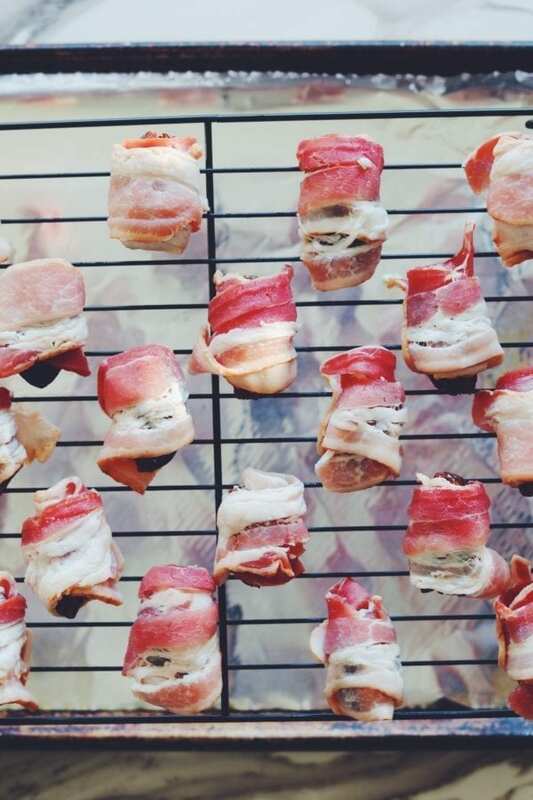 Every Valentine’s Day, I make bacon wrapped dates. It’s kind of like my own little love tradition that I started back when I lived in Brooklyn. There’s just something so perfect about these little sweet and savory morsels that just makes my heart all warm and fuzzy. Last year, when I catered my soon-to-be sister in law’s party, I served them like little edible bouquets. 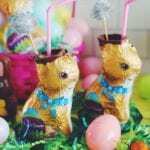 They were such a hit and of course they were absolutely delicious and made the perfect table centerpiece! 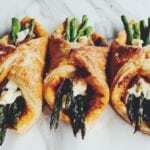 This year, I wanted to make them even more delicious so I stuffed them with Point Reyes Blue Cheese. This is one of my favorite American-made blue cheeses. It’s a relatively bold blue cheese with earthy notes and a salted caramel finish. When it’s baked, it even becomes mild enough for those of you who don’t like stinky cheeses. To be honest, I could eat an entire block of it by itself! But when you bake them with the dates and the bacon, it becomes even more irresistible. Oh, and if you can find the Point Reyes Bay Blue where you live, go ahead and do yourself a favor and buy one of those! It’s one of my favorite cheeses in the world! 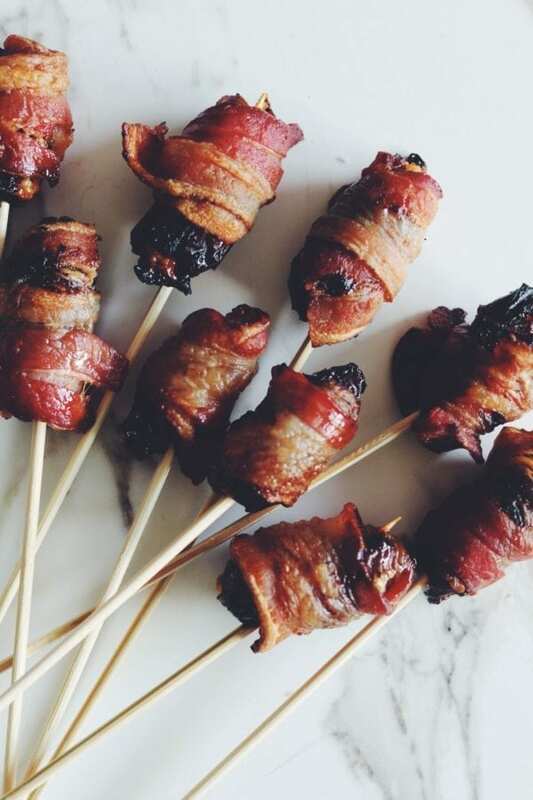 Making bacon wrapped dates (also known as devils on horseback) is super easy! All you have to do is preheat the oven to 375F and line a baking sheet with tinfoil and place a baking rack on top. The baking rack will keep the grease and extra cheese from oozing out, sticking, and burning. 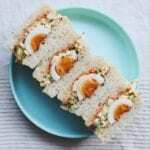 If you don’t have a baking rack, you can also try folding a bunch of tinfoil strips into long rolls to create a little ledge for them to sit on. Or you could skewer them and rest them against the sides of the pan – basically you just want to try to keep them from sitting in their own drippings. Once your baking sheet is set up, it’s time to stuff the dates. Carefully cut a tiny slit down the side of each date. Open it up and stuff each one with a tiny wad of blue cheese. Press the date halves back together — the cheese will act like the bonding agent. If you don’t like blue cheese, you could either leave it out completely or you try another cheese like manchego. 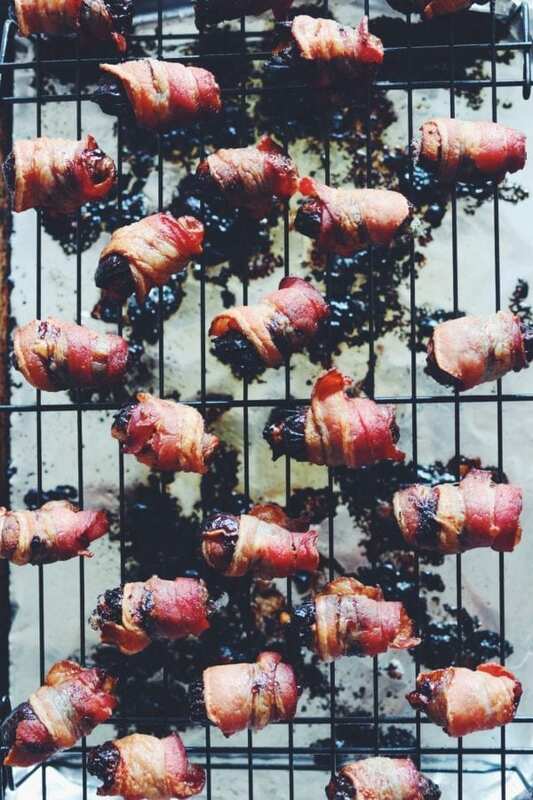 Next, wrap each cheese-stuffed date with a half a slice of thick cut bacon. Try to have the tail end of the bacon on the opposite side of the cheese slit. When you add them on the baking sheet, you’ll want to place the tail end of the bacon on the bottom with the cheese slit facing up. This will also help the cheese from oozing out while keeping the bacon wrapped around each date. Line the cbacon wrapped dates on the baking sheet and bake for 20-30 minutes or until the bacon is cooked through. Remove them from the heat and let sit for about 10 minutes. 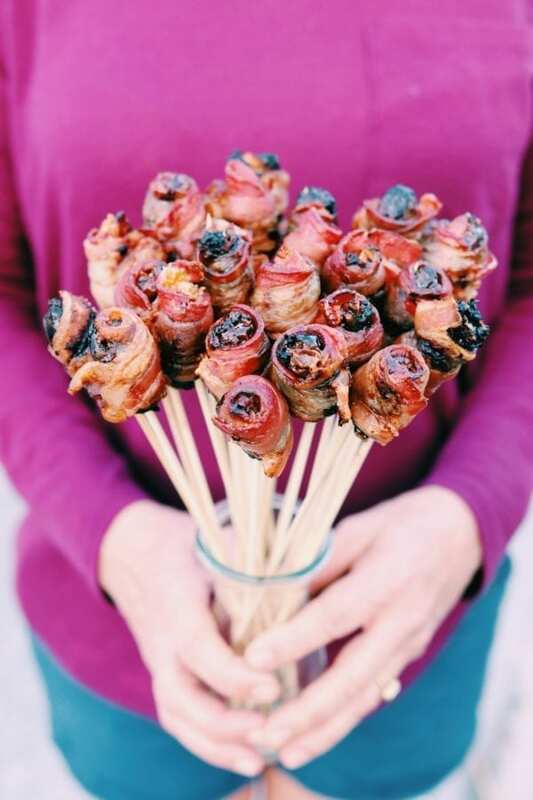 Then, carefully skewer each bacon wrapped date through the bottom of the morsel (as pictured below). 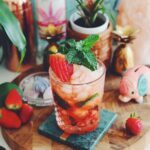 After each one is skewered, place them in a small vase and enjoy! 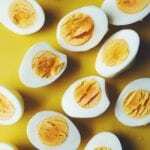 These can be made up to a day in advance – just be sure to keep refrigerated. 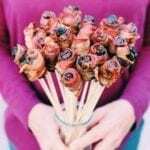 This DIY Cheese and Charctuerie Bouquet is made with bacon wrapped dates stuffed with blue cheese - it's sweet, salty, cheesy and meaty - and it makes the perfect gift for foodies! Preheat oven to 375F. Line a baking sheet with tinfoil and place a cooling rack on top. 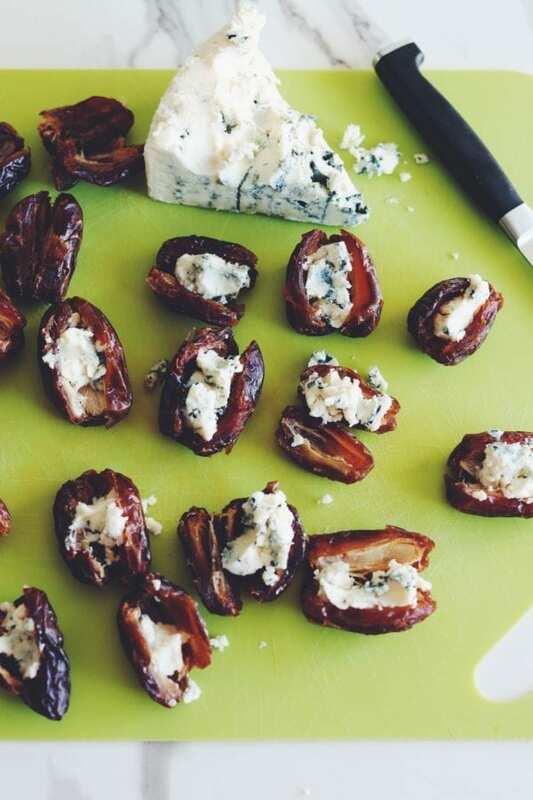 Cut the side of each date (being careful not to cut all the way through) and add a pinch of blue cheese and stuff it inside. Press the date back together and wrap each date with a half slice of bacon. If at all possible, try to keep the cheese cut-side facing up, with the bacon cut-side facing down. This will help keep the cheese from cooking out while also keeping the bacon wrapped around each date. Bake for 20-30 minutes or until the bacon is cooked through. Remove from heat and let cook for 10 minutes. 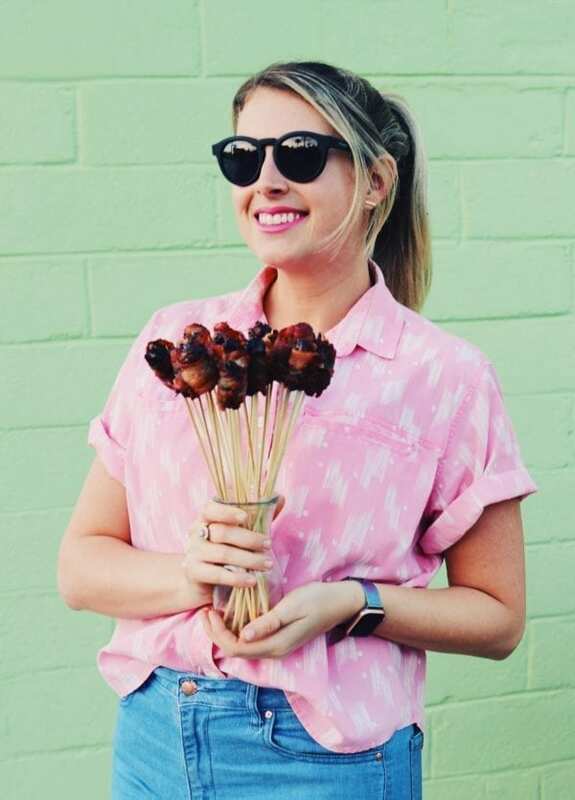 Skewer each bacon wrapped date and place them in a small vase. If you’re having trouble with them slipping down, try to skewer it through the bacon as it's thick texture holds up the best. If you can't find Point Reyes Blue Cheese you can most definitely use another brand. And if you don't like blue cheese you can leave it out completely or swap it for another cheese like Manchego. 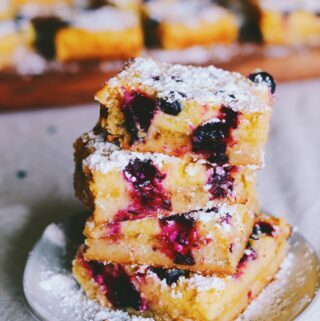 And if you like this recipe, you might also want to make one of these dishes for your lover! Alpine Mac n Cheese with Bacon and Caramelized Onions: This creamy cheesy bacon-y pasta with caramelized onions and gruyere cheese is the perfect meal to make for Valentine’s Day! Its cheesy goodness is basically love in edible form! How to Build a Cheese Plate in Under $30: If you’re trying to impress a loved one this Valentine’s (or Galentine’s Day!) then this is one of the most affordable ways to do it! In this post, you’ll learn how to create a beautiful yet totally cheap cheese and charcuterie plate! Nutella and Strawberry French Toast Grilled Cheese: This is totally a throw back recipe, but it’s one of my favorite ways to start the holiday! Chocolate-y nutella, creamy mascarpone, and fresh strawberries and pressed between a few slices of challah bread french toast and then grilled! 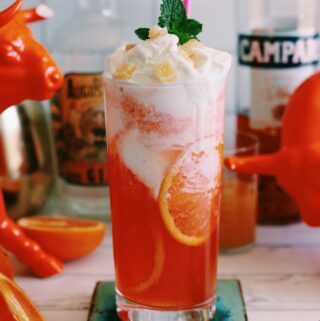 It tastes just like love!